For my 100th post I wanted something special. I cannot imagine anything that could be better than Rava Kesari or Halwa, one of the simplest though a most favorite of Halwas, which is often made as a divine offering on many auspicious religious occasions all over India as well as at special breakfasts and teas. It is also a quick dessert to make along with the other emergency cream of wheat dish, Upma, when unannounced guests arrive as the ingredients for making them are common staples readily available in most homes. This lovely sweet dish probably got the name of 'Kesari' because it is foremost or 'a lion' among sweets (kesari's Sanskrit meanings). It is probably unlikely that 'kesar', a Hindi word for saffron, contributed to its name since Hindi was not a very well-known language in the south until the modern era. Although it is generally known as Kesari in South India, in other states, Northern and Southern, it may be called Kesari Bhath, Seera, Sheera, Suji Halwa, or simply Halwa. Kesari (also known as Sojji in the state of Tamil Nadu) is customary at the "girl-seeing" ceremonies along with Bajjis (veggie fritters) in South India when a young man and his family visit a prospective bride and her family for the first time. The popular Sojji-Bajji theme with its endless possibilities for mischief lends itself to a lot of hilarity in many Tamil movies. Here is the basic traditional recipe for this wonderful dish though there are many variations - sometimes whole wheat/another flour is used instead of cream of wheat, milk in place of some or all of the water, etc. Although at our home it is made simply - most of our family members are purists :-), other recipes include mashed ripe bananas, crushed or finely chopped pineapple or mango, etc. The fruit is added towards the end of cooking and cooked for a few minutes until well incorporated. Toasted Almonds and/or Pistachios may be added or used to decorate also. Serve Kesari hot or warm - the wonderful aromas are best enjoyed while warm; it is truly an olfactory as well as a gustatory delight. Cold numbs it and just doesn't do justice to all the fragrant ingredients. When I make kesari, usually it doesn't stick around to get cold :)! Rava or Suji are the Indian names for cream of wheat; cream of wheat as well as all the other ingredients are readily available in Indian markets. Roast the cream of wheat using some of the ghee until golden brown and fragrant in a skillet - constant stirring is essential to prevent burning. Alternately dry roast (without any ghee) the cream of wheat in the oven by spreading in a large pan or rimmed cookie sheet at 350 degrees F until golden stirring once or twice. You can use it right away or let cool and store in an airtight container; this step may be done ahead. Crush the cardamom pods slightly to remove the dark seeds inside; discard the pods. Crush the seeds and the saffron threads with a teaspoon of sugar (the sugar helps to grind the seeds and saffron) to a fine powder and set aside in an airtight container until needed. This is best done just before making the kesari to prevent the fragrant volatile oils from evaporating. Sauté the cashews in a little of the ghee in a small pan until golden; stir in the raisins and sauté until puffed. Set aside to stir into or decorate the kesari. Heat the water in a kettle/pot and keep ready. Melt the ghee/butter in a large heavy bottomed pot, stir in the cream of wheat, and mix well. Pour the hot water slowly into the cream of wheat while stirring constantly - if you use the lesser amount of water, the kesari will be fluffy; the larger amount of water will produce a softer one. Stir in the sugar, cover, and cook over low heat until the water is absorbed - about 15 minutes or so. Uncover and cook over medium heat stirring vigorously for a few more minutes until the kesari is no longer sticky and leaves the sides of the pot. Remove from heat. Sprinkle the ground cardamoms-saffron, mix well, cover, and let rest for 15 minutes. Stir in the roasted cashews and raisins if desired or save them for decorating individual servings. Now you have the choice to serve the kesari as a cake cut in pieces or in soft scoops. If you decide to dish out the kesari simply in soft scoops, just leave covered in the pot until ready to serve. If you decide to serve the kesari in pieces, spread all of the hot kesari in a 9" by 13" pan (buttered with ghee) and firmly smooth the top. Cool slightly and cut into desired shapes and sizes. Kesari can be made ahead of time and reheated just before serving. Enjoy Kesari for Happy July!! Here is another classic South Indian rice-bean dish that is just superb! It is very similar to the North Indian Kichdi or Italian risotto. Just like a risotto, it is often served in restaurants and on formal occasions. You can use a wide variety of vegetables; onions, eggplants, carrots, regular and sweet potatoes, Indian drum sticks (pods of the Moringa tree), green beans, chayote, opo, zucchini, or other summer squashes, winter squashes like pumpkin, sweet peppers, fresh or frozen peas, etc are all great for this dish; use one or two kinds or an assortment. In India it is considered quite auspicious to use 5, 7, or 9 assorted vegetables and often up to a dozen may be added. I personally like using an assortment of vegetables for the flavor and color as well as nutrition. It is a wonderful one-pot dish that is good for family as well as company meals; when I make it for family I don't add the cashews as they get soggy upon standing. If you like to use them, sprinkle them over the individual servings. Use ghee if possible as the flavor it imparts to the dish is irreplaceable. If you use oil for the thalippu, at least add a little browned butter too at the end. All one needs to complete the meal are lots of crisp papadams (fried or roasted) and a raita. This is the easy version of Bili Bele Rice using a commercially prepared Sambhar powder. The other version uses freshly roasted and ground spices. Sambhar Powder is readily available in Indian markets. Sort dal for stones or other debris. Wash both the dal and the rice well. Place in a pot with 4 cups of water and cook until tender. Set aside. Dissolve the tamarind paste in 2 cups of water in a large pot. Add turmeric, salt, sambhar powder and the vegetables. Bring to a boil, reduce heat, and simmer until veggies are tender. Heat the ghee in a small pan; fry the cashew pieces if using the raw. Remove with a slotted spoon and set aside. To the ghee in the small pan add the mustard seeds, fenugreek seeds and chili. When the seeds pop, sprinkle the asafoetida and add the curry leaves quickly and cover to avoid them exploding hot oil everywhere. Pour the thalippu over the rice and dal along with the cooked veggies with all of the juices. Stir well and allow to rest for 10 minutes. Rice and bean dishes are well loved in many variations not only in India, but also in many other countries; there are countless numbers of rice-and-bean dishes the whole world over. In the northern states of India rice and dals are combined with spices and vegetables to make Kichdi though they vary from state to state. Pongal, Ven Pongal, Bisi Bele Rice, Pulagam, etc are made in the Southern States. The combination of grains and lentils make for complete protein complementarity and wholesomeness. It can serve as an inexpensive yet attractive, filling, and delicious meal any time of the day. It is definitely part of the repertoire of comfort foods in our household. Every country, why every culture, has their own special version. In Egypt, we had Kusherie (it even sounds like "kichdi") and Risi e Bisi in Italy. Other countries also have similar dishes such as Kedgeree in the British Isles, Casamiento with rice and black beans from El Salvador, Arroz-Feijao with rice and black, red, or blond beans from Brazil, Red beans and Rice from Cuba and myriad others. I love making Kichdi not only because it is delicious, but also being a wholesome one-pot meal it cuts down on precious meal prep time on weeknights. Since it freezes very well too, one can make a double batch and freeze some for another day. Kichdi is typically made from rice, split mung beans, vegetables, and spices. Other dals such as chana or masoor could be used instead of the mung or a combination of different dals may be used just as in Brown Rice-Barley Pongal. 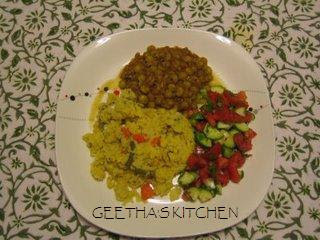 Kichdi can be prepared fluffy or more or less creamy and soft - depending on the amount of water added. It is served piping hot with the traditional accompaniments: pickles, papadums, and a raita or plain yogurt. This Kichdi is not very spicy in spite of the spices listed here; if you like a more spicy dish you can increase the spices or add crushed red pepper flakes to the rice-dal during cooking instead of/in addition to the red chilies in the thalippu. Mild, soft, and wholesome Kichdi is often prepared during convalescence as it is considered easy to digest. It is also a great first food for little ones. Sort dal, wash the rice and dal in several changes of fresh water, and drain well in a sieve. Or just place rice and dal in the sieve and rinse well until the water runs pretty clear. Let it drain. Bring 6 cups of water to a boil in a large pot and stir in the rice and dal. Add turmeric and salt and bring to a boil again, reduce heat and simmer partially covered - if the rice mixture is boiling vigorously, it will boil over and make a mess; so keep the heat low. Prepare the vegetables while the water/rice-dal is boiling; chop potato and carrots into bite-sized chunks, remove ends and chop/snap the green beans into 1" pieces, separate the cauliflower into small florets and chop the stems. As soon as the the rice-dal mixture starts simmering add the potato and carrot pieces. Prepare the thalippu: Heat the ghee in a small pan and add the chili, cumin and fennel seeds. When they sizzle a bit, add asafoetida and the ginger and cook for a few seconds. Pour the entire contents of the pan into the kichdi pot and stir well. 15 minutes after adding thalippu, add the rest of the veggies. At this point more boiling water (about 1 or 2 cups) may be added if the kichdi appears thick; especially if you prefer a soft kichdi. Simmer the kichdi until rice, dal and all the veggies are tender, about 15 more minutes. Remove from heat and allow to rest for 10 minutes. Serve hot with a little pat or butter or ghee and the traditional accompaniments of hot Indian pickles, papadums, and a raita or plain yogurt or as desired. Note: Kichdi is not stirred a lot in order to prevent it from becoming mushy; use a thin, flat wooden spoon/spatula to stir when needed. Molakootal brings memories of childhood and school days. Amma made it quite often as it was everyone's favorite regardless of the vegetables in it. This was the other dish besides Aviyal that our Amma did not have to worry about her children getting their daily quota of veggies! We gobbled every speck of it in record time. Mild and delicious with the fragrance of coconut and cumin, it is filling and comforting as well as being nutritious. Amma always made some type of rasam such as Toor Dal Rasam or Lemon/Lime rasam on spinach molakootal days. Most mild vegetables will combine quite happily in this dish. My suggestions are: sprouts, opo squash/any summer squash such as green immature pumpkin, yellow squash, patty pan, or zucchini, green beans, chayote squash (Bangalore Kathirikai), carrots, potatoes, moqua/hairy melon, ridge gourd, tori (tender green luffa gourd), snake gourd (Podalankai), edamame (green soy beans), unripe green bananas, green unripe papayas, corn and peas. Use an assortment of veggies in any combination or just a single one. Although traditionally spinach is not combined with any other vegetables when making molakootal, it just seemed a good idea at the time and our family loved it. Do include the opo squash when you get a chance. It is also known as Bottle Gourd, Cucuzzi, Lauki, Dudhi, and Chorakai; whatever its name, this pale green squash cooks up melt-in-your-mouth succulent and luscious! Sort the dal for stones, discolored beans, or other foreign matter. Wash thoroughly and add water to cover (about 2 cups). Add turmeric and salt. Bring this to a boil, turn heat down to simmer, and cook until dal is soft and creamy. Peel and chop the Opo squash into small cubes. Add to dal and cook together stirring occasionally until soft. Alternately cook dal and squash in a pressure cooker following manufacturer's directions. Clean, wash and chop spinach. While the dal and veggies are cooking, grind together the coconut with cumin, rice, and chilies using just enough water to make grinding feasible into a fine paste. Stir ground coconut along with the spinach into the cooked dal and veggies and bring to a boil. Stir well and simmer for 5 minutes. Now prepare thalippu in a small pan with a cover. Heat the oil with the mustard seeds, red chili, and urad dal. When the mustard seeds finish popping, turn off the heat and quickly stir in asafoetida if using. Add the curry leaves carefully as they tend to be explosive when they hit the hot oil. Pop in the curry leaves quickly and immediately cover the pan and allow all sputtering to subside. Stir thalippu into the molakootal. Let rest covered for 10 minutes. Stir well and serve hot by itself or with rice and/or roti (Indian flat breads) with a complimentary sweet and/or sour dish like Tomato Chutney, Bitter Melon and Okra or Winter Squash Pachadi, piquant Tamarind, Tomato, or Bell pepper chutney, Mango or Lemon pickles. Enjoy!! This is an utterly delicious but very simple recipe - really for 2 different but delicious desserts - with or without the puff pastry. In fact you can prepare the pastries and pop them in the oven to bake while you are eating dinner; it will be ready just in time for the dessert course:). Served a la mode (with the traditional vanilla or butter pecan ice cream), it is sure to please one and all! It is easy on the eye too - apples bathed in gorgeous raspberry sauce and topped with a snowy cap of ice cream. Yummy indeed! You can make this dessert without the pastry - save the carbs and fats :). I just place the apple halves snugly in a baking pan, pour the sauce over them and bake until the apples are soft, about 30 minutes. Serve them warm from the oven, just as they are or a la mode - place baked apple on a serving dish, add ice cream and spoon some of the sauce from the pan over the ice cream. I had it at E's house this way - a la vanilla ice cream made with vanilla beans. Delicious and totally guilt-free! Purchased puff pastry sheets makes this recipe a snap to prepare. Puff pastry sheets are readily available at most markets. Take out the pastry sheets and thaw according to manufacturer's directions. Cut them into 4 pieces each and place them on a baking sheet lightly coated with a nonstick cooking spray. Wash and dry the apples; peel and cut in quarters from stem end to blossom end. Remove the blossom end and stems carefully. Remove the core with a tomato stem end remover or a teaspoon so it leaves a little hollow. Place the apples snuggled in the pastry in the baking dish. Mix all the ingredients for the sauce except the almond extract in a small pan and heat until the jam melts. Remove from heat and stir in the almond extract. Pour about 1 Tbsp of the sauce over each of the apple pieces pooling some of it in the hollows. Save the rest of the raspberry sauce for serving. Bring the corners of the pastry up so that it makes a loose cup around the apples. Bake at 350 degrees F for 30 minutes or until the apples are very soft and look shrunken and the pastries are golden. Remove from the oven and let cool for 5 to 10 minutes. Place the warm pastries carefully in serving dishes. Note: If you don't have seedless raspberry jam, press the jam through a fine sieve to remove the seeds. Upperi is a simple, traditional, everyday, vegetable side dish from Kerala. It might be a contraction of 'upakari' or 'upkari' which means side curry. Whatever the origins of the word, the dish is delicious and simple to make. There are two types of Upperi; one being a vegetable side dish and the other actually crisp chips or wafers from mainly plantain bananas and unripe jack fruits. Chips are also made from manioc or cassava roots, arbi corms, a true yam called chenai, bitter melons (parikkai), and of course potatoes - regular or sweet. Many vegetables such as unripe green bananas, bitter melons, broccoli, Brussels sprouts, green unripe papayas, green beans, cabbage, okra, eggplants, potatoes, bell peppers (capsicums), etc are all good candidates for making Upperi. Vegetables with a high moisture content like tomatoes are not used for making Upperi. The chopped (precooked until just tender if you like) vegetables are simply stir fried until slightly roasted with a little turmeric and salt. Upperi can be made with or without a little thalippu/tadka of mustard seeds, dry red chili, and urad dal. Here is an Upperi using cauliflower, a family favorite. Wash the cauliflower well and drain. Separate into small bite-sized florets. Discard the tough central core but chop the stems into the same sized pieces as the florets. Heat oil in a large skillet or wok and add all the spices; when they become fragrant and the dal is pinkish, add the curry leaves, cauliflower pieces, salt, sambhar powder if using, and turmeric. Stir well, cover and cook on medium heat stirring occasionally until tender. Remove cover and stir cook for a few more minutes until the veggies brown slightly. Serve hot with rice or chapatis, any stew-like dish such as mor kuzhambu/kootan, gothsu, dal, raita, etc. I love the flavors of Cilantro-Pepita dressing served over Mexican Ceasar Salad and find that this recipe is more than satisfactory. Since many of the prepared ones ready for purchase have mayonnaise (eggs) in them I decided to make my own. This is a wonderful dressing to have on hand for salads, as a dip for crisp raw veggies, chips, sandwiches, and over quesadillas. It can also do double duty as a chutney to serve with bajjis, pongal, etc. Salt to taste - If Parmesan is used, less/no salt will be needed. If the oven is being used anyway, roast the nuts/seeds in the oven: spread them in an ungreased baking pan and toast in a 350 degree F oven for 10 minutes. If not, just dry roast in a small pan. Cool. Sort, clean and wash the cilantro thoroughly. Trim root ends off and chop coarsely. Wash, trim off root end, and chop the green onions coarsely. Slice off the stem of the chilies, cut in half lengthwise and remove the seeds and the white membranes (wear rubber gloves to protect your hands). Squeeze the lime/lemon, set aside the juice and discard the rinds. Combine all ingredients in a blender container and process until smooth. Taste and adjust the seasonings. This dressing is pretty mild; leave the seeds and membranes in or use more chilies for a spicy dressing - taste after grinding and then decide for yourself. Chill in a covered jar until ready to use. The dressing with stay fresh for about a week in the refrigerator. Variation: Use all parsley or a combination of half cilantro and half Italian parsley instead of all cilantro. This salad is a great one for pot lucks as it can be made up to two days ahead. This one is one of our favorite combinations of vegetables for their color and texture; I make it year around with whatever vegetables are available seasonally. Choose a combination of vegetables and herbs according to your taste and seasonal availability. The salad just needs mixing with the dressing at the last minute! Creamy Cilantro dressing is one of our favorites with this salad. If the oven is being used anyway, spread the nuts in a baking pan and toast at 350 degrees for 10 minutes or until lightly browned. If oven is not used at this time, toast the nuts/seeds using a skillet or pan over medium heat stirring constantly until roasted. Let cool and save in an air tight container until ready to use. Sprinkle the nuts over the salad just before serving or serve on the side. Wash and spin or towel dry the romaine, spinach, parsley, arugula, and escarole. Wash and dry all the other veggies. Tear escarole into small bite sized pieces. Slice romaine into thin ribbons. Pull off the leaves from parsley stems and chop the leaves coarsely. Thinly slice the red cabbage, bell peppers and radishes. Grate the carrots. Chill individually until ready to serve. The veggies will stay fresh for 2 days. Arrange the veggies in mounds on a large platter or combine them in a large bowl when ready to serve. Toss the salad with the nuts/seeds, cheese and dressing or serve them on the side. Anything Do Pyaza has either an abundant quantity of onions or has two different types. Paneer Do Pyaza is wonderful served with the traditional meal of rice/roti, dal, and raita or as a sandwich filling. One of our favorite ways to serve it is to make a wrap using whole wheat chapatis. 1 Block Paneer cheese, 14 oz. Crumble the paneer or cut into small cubes. Heat the oil with the cumin until sizzling and fragrant; add the red pepper flakes, regular onions, salt and turmeric and cook stirring until translucent. Add bell peppers and tomatoes and cook until softened. Stir in paneer and cover and cook for about 10 minutes or hot throughout. Stir in the green onions and cook until wilted, about a minute or so. Spoon into a serving dish and sprinkle the chopped cilantro on top. A very quick and easy Lasagna that is tasty too. Leftover or extra veggies from Roasted Vegetable Sandwiches or Tricolor pasta will make it a snap make this dish as well as the use of no-cook Lasagna noodles and purchased Marinara sauce; you can also use a well seasoned homemade sauce if you wish - you would need about 2 quarts plus a little more for serving. For a gluten-free, soy-less and dairy-free dish, use corn tortillas for the noodles, mashed pinto or other beans instead of the ricotta cheese and tofu, and omit the Parmesan cheese. All one needs to complete the meal is a crisp green salad and may be some fresh crusty bread. Place a dollop of the Basil-Parsley Pesto in a shallow dish and pour a few Tbsp of Extra Virgin Olive Oil as a dip for the bread. If you don't have roasted vegetables already, chop the veggies, onion, and garlic; toss them with 1 or 2 Tbsp of extra virgin olive oil and a pinch of salt and pepper and bake at 400 degrees F until veggies are soft and lightly browned, about 15 to 20 minutes. This can be done up to 2 days ahead. Mash the ricotta or tofu and mix well with 1/3 cup of the Parmesan cheese, freshly ground black pepper and the pesto. Coat a 9" by 13" pan with oil or non-stick spray; pour a layer of sauce (2 cups) on the bottom. Place a layer of the noodles/corn tortillas and cover with 2 cups of the sauce. Spread the ricotta/tofu mixture and sprinkle with 2 Tbsp of the Parmesan. Place another layer of the noodles/corn tortillas on top of the cheese. Cover the noodles with another 2 cups of the of sauce. Spread the roasted vegetables evenly over the noodles/tortillas and sprinkle with 2 Tbsp of the Parmesan and some black pepper. Cover with another layer of noodles, 2 cups of sauce on top and sprinkle the remaining Parmesan on top. At this point the assembled lasagna can be chilled until ready to bake; add 10 to 15 more minutes of baking time if you chill the lasagna. Bake for 45 minutes at 350 degrees F and check the lasagna. If lasagna seems dry, spread a little more of the sauce on top. Continue baking for 15 more minutes. Allow to cool and rest for 15 minutes. Serve hot or warm with more sauce (heated) if desired. Chundals, whether sweet or savory, are delicious and delightful snacks that I recall fondly from my childhood days. They are a must for a festival called Nav Ratri (Nine Nights) or Dussera in Autumn akin to a combination of Halloween and Christmas traditions minus the costumes, tricks and Santa Claus. Just as at Christmas time, South Indian people set up beautiful displays called "Kolu" with their collections of statues of deities, dolls, toys and decorations in their homes. At our aunt's house something new and elaborate would be created every year. Kolu time in our ancestral villages was more fun as there were many homes to visit close by and the families knew their neighbors for generations. The children in the neighborhood had implicit invitations to visit the various homes every evening during the festival. We could barely wait for the festival to start so we could visit friends and neighbors, admire their beautiful decorations and express our enthusiastic exclamations of joy and wonder. A little consultation with the village children gave us clues as to exactly which house we should visit for the best decorations and just as important, the best treats :-)! Our contribution to the event was to recite any devotional songs/chants that we knew. After our little performance, we would receive a treat that was made as an offering that day - usually some type of savory or sweet chundal. I am partial to the savory chundals, my all time favorite being brown chick pea chundal. Other whole beans or split legumes may also be used to make chundals. Dried peas and split legume chundals taste great with a squeeze of lime/lemon. Although traditionally chundals are made with unsprouted dried legumes, I like to make them with sprouts also. If you have sprouts on hand, it takes just a few minutes to make nutritious and delicious chundal. One of my favorite childhood pastimes was to sit on the back porch steps with my bowl of chundal and toss an occasional bean/pea to the birds and watch them catch it in their beaks midflight :). If using dried beans/peas, sort, wash and soak them for about 6 hours or overnight in plenty of fresh water; the soaked beans/peas swell to about 2 to 3 times their original size. Drain, rinse and cover with fresh water to cover. Bring to a boil, and simmer until soft but not mushy. Drain and cool; reserve the broth for soups - it is a rich source of soluble fiber, vitamins, and minerals. If using sprouted beans, steam lightly if you wish or just use raw and cook for a few minutes with the seasonings. Heat oil in a large Indian wok or skillet and add the mustard seeds, urad dal and red chili. When the mustard starts to pop and the dal is turning pink, stir in asafoetida. Quickly add the curry leaves and the cooked beans/peas or the raw sprouts and the coconut pieces. Heat stirring for a few minutes until dry and well mixed. (Add a pinch of turmeric and salt if using raw sprouts and cook until just tender). Remove the chilies before serving so no one chews on them inadvertently; chilies, other whole spices, curry leaves, etc are not generally eaten unless the diner specifically wishes to do so. Serve hot, warm or at room temperature with steaming mugs of Pudina Chai/Mint Tea Latte or Masala Chai or cool frosty glasses of the afore mentioned chai/teas or Iced Coffee. Chundal can be served as a side dish with a meal also with rice, breads, curries, etc. In Chennai, India, the dried whole peas chundal is very popular; beach goers there are very familiar with the vendors' call for sampling their "Thenga, Manga, Pattani Chundal" which literally means "coconut, mango, peas chundal". So if making the dried peas chundal, you can stir in finely chopped green (unripe) mango and/or squeeze some lime juice before serving. A lovely and light tasting salad for a warm spring or summer day! Be sure not to overcook the pasta for best results - it should still be firm to the bite. All one needs is a cool, frosty beverage: Pudina Chai/Mint Tea Latte or Iced Coffee. Cook the pasta according to directions on the package. Or here's how I do it to conserve fuel: Bring the water to a boil, stir in broken up pasta, bring to a boil again, stir well, turn off the heat and cover. Let sit for about 7 or 8 minutes; check to see if the pasta is cooked enough. If it is tender without a core of uncooked grain, stir in a cup of ice cubes to stop the cooking. Drain well. Put the drained pasta in a large bowl and immediately coat it with the olive oil; add enough of the oil to moisten well but not make it too oily. Add all the other ingredients and toss well to mix. Let sit for at least 30 minutes for the flavors to mingle and marry. Chill if made ahead; but remove from the refrigerator about 30 minutes before serving to allow it to warm up to room temperature. Serve at room temperature with lots of freshly ground black pepper. Pudina Chai or Mint Tea Latte is a refreshing hot/cold beverage wonderful any time - with afternoon snacks or after a heavy meal to aid the digestive process. Mint is considered soothing for head aches as well as stomach aches both in the Oriental and the Occidental Lore - wisdom knows no boundaries :-). Pallavi loves her pudina chai so much that she never travels without a supply of fresh mint leaves to whip up a cup of pudina chai at a moment's notice to everyone's delight. Friends and pudina chai - one cannot ask for too much more in life!! In Pallavi's own words, simply "too good" :-)! Bring the water to a boil with the ginger. Stir in your preferred sweetner to taste*, tea leaves, milk and mint leaves and return to boil. Remove from heat and strain into a pot. Serve hot by itself, with cookies, sweets and snacks, or any time or chill to serve cold. *Generally Indian teas are not syrupy sweet; just enough sugar is added to round out and meld the flavors. Make these delicious thick vegetable laden pancakes reminiscent of the Chinese egg fooyong or the Japanese Okonomiyaki when you have leftover Adai batter. The vegetable adai can fool one into thinking that it is okonomiyaki! Imagine that!! The leftover batter (kept at room temperature) ferments slightly the next day and has a wonderful tangy flavor and makes for delicious vegetable adais. My favorite veggie combo is: sprouted Mung Beans, shredded red cabbage and carrots, finely sliced onions and bell peppers. This particular combination of vegetables is a feast for the eyes as well as the palate. Serve with coconut or green chutney, raita, or any kind of hot Indian pickles. Mix the batter with the salt, curry leaves, ginger, chili, veggies, and cilantro. Heat a griddle or skillet coated with a thin film of oil. When a tiny droplet of water is flicked on the skillet sizzles and dries up quickly, the griddle is ready. Throughout cooking adjust the heat so that the griddle is hot but not smoky or burning. Pour a tablespoon of batter onto the skillet and drizzle a couple of drops of oil around it. When the top looks dry, turn over and cook the other side until golden brown. Taste the little adai and correct the seasonings of the batter. Pour about 1/2 cup of batter and spread quickly into a thick circle. Drizzle a few drops of oil all around it, cover, and cook until the top is a little dry. Slide a thin spatula under and all around the edges to loosen the adai; flip over to cook the other side to a golden brown. Remove and fold in half. Continue cooking the adais until the batter is used up. Serve the adais hot off the grill. Vegetable adais are great for a meal or a snack. Tiny ones are wonderful to serve as appetizers or starters also. This raita or pachadi is simple and delicious and is spiced simply with roasted cumin seeds. It is a cool and refreshing summertime recipe. Raitas are best eaten immediately but will keep up to 2 days. I like using the hot-house or Persian cucumbers for their mild taste for this dish; plus their skin is very tender so no need to peel - less time for meal prep! Wash and dry all the veggies. Peel the cucumbers if they are waxed or have tough skins. Cut in half and check the seeds; if they are tender and immature, go ahead and chop finely. If the seeds are mature, scoop them out before chopping. Finely chop the onions; halve the cherry tomatoes. Place all the ingredients in a bowl and mix with most of the ground roasted cumin seeds; save a couple of pinches for garnish. Place the raita in a serving dish, sprinkle the saved ground cumin and ground red chili/cayenne/paprika in a decorative design and chill until ready to serve. Serve cold by itself, with sandwiches, rice, breads, curries, etc. Our mothers, grandmas and aunts were very frugal but extremely creative to provide the family with delectable food while keeping wastage to a minimum. Kunukku was one such invention to incorporate leftover batter to make fabulous snacks similar to pakodas. If the batter is too thin, a little whole wheat flour (1 or 2 Tbsp at a time) may be stirred in; it should be as thick as pancake batter. A half cup of vegetables like finely chopped onions, cabbage or spinach may be added to the batter. Kunukkus are so delicious that one is known to prepare them on occasion from fresh batter also! Mix the batter with salt, chili, curry leaves and ginger. Heat the oil until very hot but not smoking; a tiny dribble of batter dropped in it should sizzle and start to brown right away, but not get very dark quickly. Carefully and gently drop small amounts of batter - rounded tablespoons - into the oil without splashing hot oil. Drop as many as will fit the pan without crowding. Turn over gently to brown on all sides. Break one kunukku open; if it is wet, the oil may be too hot. Turn the heat lower so the kunukkus cook well and brown. Remove carefully from the oil with a slotted spoon and drain well on paper towels. Serve hot with Green chutney, Date-Tamarind chutney, or with ketchup. Enjoy!! If you have the Ragada and Vegetable Patties/Burgers prepared ahead of time, this popular dish based on one of Bombay's favorite street snacks goes together quickly. The chutneys can be home-made or purchased from an Indian market. You can set up all the ingredients for a buffet style meal and watch it all disappear in record time :-). Make Ragada and the Vegetable Patties/Burgers; keep them hot. Place one or two patties on a plate and spoon about 1/4 to 1/2 cup of the Ragada over them. Drizzle with the chutneys according to taste and sprinkle the onions and cilantro over them. Variations: Instead of Ragada, spoon Chole Pindi over the patties for what is known in some cities as "Chole Tikki". A dollop of plain yogurt is great on the side or on top. An Indian snack called "sev" or "omapodi"( ready to eat crunchy fine noodles), chopped roasted peanuts or cashews, etc sprinkled on top add nice texture and wonderful taste. This is another household pet chutney/relish that is good to have on hand to do its magic on all kinds of snacks like Bajjis, Pakoda, Kunukku, and Ragada-Patties. It is quite easy to make and will store in the refrigerator for a couple of weeks in an airtight jar or in the freezer for longer storage. Combined with the Green Chutney it makes a delicious salad dressing especially for chopped salads like Kale Bhel Salad. Soak the Tamarind pulp in 1/2 cup of boiling water. When cool enough to handle, mash with your fingers to remove any seeds, fibers or shell pieces. Heat the oil in a small pan with the spices: cumin, coriander and chili until slightly browned and aromatic. Remove from heat and cool. Place tamarind pulp and all the rest of the ingredients in a blender jar and whirl into a smooth chutney. Add a little more water if necessary; the chutney should be thicker than pancake syrup but not as thick as ketchup. Taste and adjust the salt and sugar to balance with the hot and sour tastes. Store in the refrigerator until ready to serve. Paruppu means Lentils in Tamil and usli means crumbles. Lentil-rich Paruppu Puttu/Usli compliments (not only in taste but also in protein) tart soupy dishes like Mor Kuzhambu, or Kootu/Curry, and Vattal Kuzhambu which contain no lentils. The lentils, seeds, and yogurt when eaten with grains combine to provide a hearty and nutritious meal. This dish defies translation or description; you just have to experience it! It is delicious by itself or served as a side dish. Paruppu Puttu/Usli can be made with various vegetables like green cabbage, green beans, yard long beans, gavar beans, broccoli, etc and takes on the name of that vegetable - one example is "broccoli paruppu usli". Amma had the idea to make it with broccoli and now it is one of our favorites! 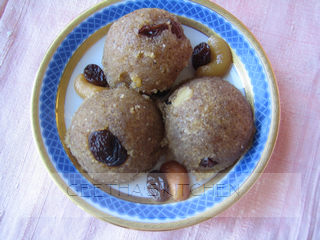 The paruppu (dal) part may be cooked 2 ways; steamed first or cooked in the skillet directly. If cooking directly in the pan, stir in the ground dal mixture after the thalippu is prepared and cook covered until the dal is cooked - about 15 to 20 minutes. Sprinkle a little water if it dries out and cook stirring every few minutes before adding the veggies. Sort the dal for stones or discolored beans. Wash and soak in fresh water for 1 hour. Drain and grind coarsely along with the salt, asafoetida, curry leaves, and red chili using a food processor - food processor works very well as you can puree the dal without any water. Use a blender if a food processor is not available - grind coarsely - add water in very small quantities only when absolutely necessary to process. Scoop out and place in an oiled small cake pan and steam over boiling water until cooked for about 15 minutes. Test by inserting a pick near center; if the pick comes out clean, it is cooked. Allow to cool. Coarsely crumble when cool. Cook the chopped vegetables lightly in a microwave oven or steam them. If using cabbage, use raw without steaming. Heat the oil in a skillet/wok/kadai and add mustard seeds, urad dal, and chili. When the mustard seeds pop, add the asafoetida and the curry leaves and the crumbled dal. Stir fry on low to medium heat for about 2-3 minutes. Stir in the vegetables and stir fry until all is hot and veggies are done to your liking. Serve hot or at room temperature with rice, chapatis, Mor Kuzhambu/Kootu/Curry, Gothsu, Vattal Kuzhambu, or as desired. Mor Kuzhambu or Kootan is a South Indian classic stew of mild flavored vegetables in a yogurt sauce flavored with coconut and cumin seeds. It is another one of our family favorites from my childhood days. The 'zh' is only an approximation of a letter found only in the languages Tamil or Malayalam which is often substituted by 'l' as in Kolambu. To me the closest approximation for 'zh' sounds like the 'r' in mercy. Ripe or unripe plantain (a type of banana), Winter Melon (Elavan), Taro root - Arbi in Hindi -(Colocasia esculenta) or Chenai (a true yam), ripe or unripe Mangoes, Okra, Chayote squash, Cucumbers, Opo squash, etc are the traditional favorites for making Mor Kuzhambu. Potatoes, eggplants, zucchini, etc also can be used to make this kuzhambu. Choose your favorite vegetables. Note: The uncooked rice in the ground masala of coconut and spices is very important when cooking with yogurt as it provides the starch to keep the yogurt from curdling. Also, Yogurt curries must not be allowed to boil as too much heat will curdle the yogurt even with the starch present. Place the prepared vegetables of your choice in a large non-reactive pot (stainless steel, ceramic, etc) with 1/2 cup of water, the salt and turmeric. Bring to a boil, reduce heat and simmer until just tender. While the veggies are cooking, grind the coconut with the cumin, chili, and rice into a nice puree with a little water (1/2 cup at the most). When the veggies are tender, add the coconut puree and bring to a boil again. Reduce heat and simmer gently until slightly thickened. Pour the yogurt in the blender and give it a whirl to make it smooth; pour into the veggie-coconut mixture and simmer gently until foamy. When the top looks foamy and slightly puffy, remove from heat. Be careful not to let it boil. Heat the oil and do the thalippu: add mustard and fenugreek seeds and the red chilies. When the seeds pop, add curry leaves carefully and cover quickly. When all is calm, pour the thalippu into the Mor Kuzhambu. Let rest for 5 to 10 minutes. Serve over hot rice with Cabbage Thoran, Paruppu Usli, and/or papadams. Mor Kuzhambu will last up to a week in the refrigerator; it does not freeze well. Basic Green Chutney is often paired with the sweet Date & Tamarind Chutney to offer a nice contrasting taste! Combined with the Date & Tamarind Chutney it makes a delicious salad dressing especially for chopped salads like Kale Bhel Salad. Sort out weeds and yellow leaves from mint and cilantro, cut off most of the stems from cilantro, strip the leaves and tender tips of the mint and discard the stems. Wash them well in several changes of fresh water to get rid of sand and grit. Spin dry in a salad spinner or gently blot dry with a towel. Wash well the green onion and trim off root end and any yellow leaves. Chop coarsely all of the white as well as the green parts. Cut off the stems from the green chilies and cut in half. If you like the chutney mild, remove the seeds from the chilies. Chop the chilies coarsely. You may want to wear gloves for handling chiles!! Squeeze the lime/lemon and discard the rinds. Place the lime/lemon juice and the rest of the ingredients in a blender container and process into a smooth puree. Taste and adjust lime, sugar and salt until they are well balanced. There should be just enough sugar to balance the sour and hot but not enough to make it sweet. Refrigerate in a covered jar until ready to serve. The chutney will stay fresh for about a week if kept refrigerated. Serve cold or at room temperature with snacks or meals as desired. You might think 'bitter'-melons and okra would contribute to a resounding Double Yuk!! Not to worry, I guarantee that okra will be not become slimy at all because the acidity of tamarind prevents that tendency :). Okra was one of our favorite childhood vegetables since I can remember. The bitter tang of bitter melon is positively delectable and even addicting because of the way all the flavors of sweet, sour, hot, salt, and bitter mingle and meld. I love this pachadi with any rice/roti-dal-curry combination and especially with Yogurt Rice or Pongal. Pachadi is a traditional South Indian vegetable side dish and no feast is complete without some type of pachadi. There are two kinds of pachadis: sweet/sour ones and savory. The sweet/sour Puli Pachadis are usually vegetables cooked in a tamarind sauce with a little of the Indian Brown Sugar called Jaggery or Gur and seasoned with various spices. The savory Thayir (yogurt) Pachadis usually include cooked or uncooked vegetables in seasoned yogurt. Actually, in Kerala the savory yogurt preparations are called 'kichadi' to distinguish them from the sweet or sweet/sour pachadis. Bitter melons are popular vegetables in Indian Cuisine not only because of their delicious taste, but also their great medicinal properties. According to the principles of Ayur Veda, the ancient science of health, Bitter Melons are beneficial for curing or controlling many a malady. Okra, or Lady Fingers (or Bindi or Vendakai in Hindi and Tamil respectively) are considered to be good for brain growth and development. Okra is also very beneficial to health with its abundant content of soluble fiber as well as a bevy of other nutrients - not only a rich source of fiber, but good source of vitamins A, B, C and K, and minerals. Soluble fiber is what binds excess serum cholesterol and roto-roots it out of the blood vessels and out of our system. Whatever the facts regarding their health benefits are, this is a winning combination! Wash and dry the vegetables. Cut off ends of bitter melon, cut in half lengthwise, scoop out seeds if they are not tender, and cut each half in half. Slice thinly into quarter circles. Cut off stems ends of okra and slice thinly. Cut off the stem ends of the chili and make a slit on the cut end. Combine the cut veggies with salt, turmeric, tamarind, and 2 cups of water. Bring to a boil and cook covered over medium heat until tender. Stir in the Jaggery and the rice-water slurry and bring to a boil, reduce heat, and cook until slightly thickened. Remove from heat and sprinkle the fenugreek powder on top. Cover. Make thalippu by heating the oil with the mustard seeds and chili; when mustard seeds pop, sprinkle the asafoetida and add the curry leaves and cover quickly. Pour the thalippu over the veggies. Set aside for about 10 minutes to meld the flavors. Mix well and serve hot, cold or at room temperature with rice, dal, plain yogurt, etc. Enjoy! These Vegetable Patties/Burgers are great to have on hand; they freeze well too. These come in handy for quick meals - especially with Ragada, Chole Pindi or marinara sauce spooned over them. I know one family (with vegetarian children) who likes to make and keep them in their freezer so that there is always something delicious for the children. The traditional patties consist mostly of boiled potatoes; I have added other veggies to make them more nutritious. You can make them with your favorite vegetables. It also goes together quickly as all the ingredients are raw - so not too much prep time :-). Wash and dry all the vegetables. Peel the opo squash if using. Grate all the veggies. Cut in half the chili, remove seeds, and chop finely. Finely chop the ginger. Combine all the grated and chopped veggies, salt, spices, and besan to make a soft dough. Heat a skillet or griddle wiped with an oil dipped paper towel to coat the entire surface lightly with oil. Place about 1/4 cup portions of the dough formed into patties by hand on the griddle/skillet and drizzle a few drops of oil around them. You can make 5 to 7 or more patties at a time depending on the size of the skillet/griddle. Cook over medium heat until browned on the bottom. Flip over and pat down gently with the spatula, drizzle a couple of more drops of oil, to cook the other side until browned. Remove to a plate and proceed with the rest of the dough. Serve hot Indian style with a green cilantro or mint and sweet date-tamarind chutney; or with Chole Pindi or Ragada spooned over them. The patties may also be served on a bun with all the usual burger accompaniments such as lettuce, onion, avocado, and tomato slices, American pickles, and of course ketchup. Ragada is a Western Indian dried pea stew popularized by street vendors who serve it over potato patties as a snack, especially in the Mumbai (formerly Bombay) area. As people start to return home from schools and offices, vendors get ready to sell their fragrant fare. The delicious aromas emanating form the goodies entice customers to eagerly line up at their favorite snack stands for their turn to savor the delicacies. Ragada is also wonderful served with any rice dish, chapatis or other Indian breads, and other accompaniments. I like to sprout the peas just a little to boost their nutritive value; but sprouting will take time so one has to plan ahead. Sort the dried peas and soak overnight. Sprout them if you wish. Cook the peas in fresh water to cover (about 4 cups) until very soft but not mushy. Add the salt and turmeric and set aside. While peas are cooking, make the wet and dry masalas (spice mixes). For the Wet Masala, cut the chilies in half and remove seeds; grind all together coarsely in a blender container. For the Dry Masala, roast all the spices in the oven at 350 degrees F for about 7 to 10 minutes or roast them in a skillet without any oil; cool and grind. Heat the oil in a large pot and add the mustard seeds, cumin, cinnamon stick, cloves, and whole red chilies. When mustard and cumin seeds pop, sprinkle the asafoetida. Reduce heat and stir in wet masala carefully to avoid splashing along with the curry leaves. Mix in the cooked peas, more water if a thinner consistency is desired, and simmer gently for about 20 minutes. Remove from heat and sprinkle the dry masala and stir well to combine. Let sit to meld the flavors for at least 10 minutes. Sprinkle with the cilantro and serve hot with rice/breads, raita, salad, plain yogurt and Indian pickles. Or serve Mumbai style over vegetable/potato patties called Ragada-Patties. This good looking and great tasting dish serves double duty as a main dish or an appetizer; it is great for pot luck too. Serve with any salsa like Salsa I or Salsa II or avocado salsa or Simple Guacamole with lots of fresh, warm, corn tortillas or tortilla chips. The combination of beans and corn provides complete protein and the cheese boosts it even more. It is not only incredibly easy, but also makes a very healthy snack or even a meal. Canned beans (use 2 regular sized cans - probably about a pound each) can be substituted for freshly cooked ones if time is short. Beans freeze very well so I make at least a triple batch of beans and save the extra portions for dishes such as Black Bean Salad, Black Bean Soup, or Casamiento - a rice and bean casserole. Black beans, Corn and Cheese Casserole is quite child-friendly; in fact the children can help assemble it with a tiny bit of adult help. It can be assembled a day ahead and baked when ready to serve. Drain the water and rinse the beans. Place in a large, heavy stock pot with fresh water to cover them and bring to a boil. Add salt and the sprigs of marjoram and oregano. Simmer for about 45 minutes or until the beans are very soft. Remove and discard the herb sprigs. If there is too much broth, remove and save for soup. Mash the beans well, mix with the chili powder if using and set aside. (If using canned beans, drain, rinse and mash them with the chili powder). Prepare the vegetables while the beans are cooking. Cut the jalapeño chili in half, remove seeds and membranes and chop finely ( you might want to wear gloves to protect your hands). Peel and chop the onion and garlic finely. Cut the red bell pepper in half, remove stem, seeds and membranes; dice. Heat the oil in a skillet and cook the garlic, onion, chili and red bell until just tender. Add salt and pepper to taste and stir in the corn. Spray a shallow casserole dish such as a glass/ceramic pie pan with nonstick cooking spray and spread the beans on the bottom of casserole dish. Next, place the corn mixture over the beans 1" from the sides of the pan so that there is a border of beans visible. Sprinkle the cheese over the corn. At this point the casserole can be covered and refrigerated until ready to bake. Bake at 350 degrees F until cheese is melted and the contents are hot - about 20 to 30 minutes depending on how cold the ingredients were before baking. Remove from the oven and sprinkle with the green onions and cilantro leaves. Serve immediately with warm corn tortillas or tortilla chips. Our family loves this dish with the avocado salsa. Variations: Use pinto beans (Frijoles Mexicanas) instead of the black beans. Mexican Pizza: Another fun way to serve this dish is to layer them the same way as above on individual corn tortillas, pita bread, or tostada (crisp corn tortilla) shells and bake until the cheese melts. Serve warm with your favorite salsas like Salsa I, Salsa II, avocado salsa, or Simple Guacamole, sour cream, shredded lettuce, etc.